A car drives miles east and miles north. What is the total displacement of the car? The car has covered a total distance of miles, however, displacement and distance are not the same thing. Distance is simply the measure of how far the car have moved, regardless of direction. Displacement is a vector quantity, and takes direction into account. 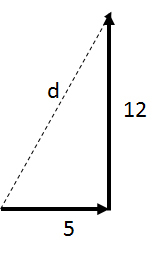 Displacement measures the total distance only between the car's starting point and ending point. To solve this question, it is best to draw a sketch. The resulting sketch will be a right triangle with the hypotenuse equal to the displacement. The Pythagorean Theorem can be used to solve the problem. A car travels due east for two hours and covers 144km. What is the car's average velocity in meters per second? This question requires us to convert between units, then solve for the velocity. First, convert kilometers to meters. There are 1000m in 1km. Then, convert hours to seconds. There are 60min in 1hr, and 60sec in 1min. In other words, there are 3600s in 1hr. Now that you have both the distance in meters and the time in seconds, you can find the velocity. Velocity is equal to the distance divided by the time. Kansas Wesleyan University, Bachelors, Mathematics. University of Kentucky, Bachelor of Science, Neuroscience.